This 500GB Freesat+ HD PVR comes from the same stable as Grundig's equivalent. Is there much to choose between them? When we tested the Grundig GUFSDTR500HD Freesat+ HD PVR in March's issue of What Satellite & Digital TV we found it to be a decent performer, if predictably not one for those looking for channels farther afield than Astra 2 and Eurobird. This Goodmans effort also originates from Harvard International and, like the Grundig, packs twin Freesat HD/SD tuners and a 500GB hard disc (enough for 310 hours of SD recordings or 125 hours of SD) as well as having a 320GB sibling (the 320HD). Rather heavy at 2.6kg, it looks a lot like the Grundig too, except here the operating buttons are rounded-off squares rather than circular. A 12V power supply makes it suitable for use in caravans, and LNB inputs are included for each tuner (plus a third redundant one). 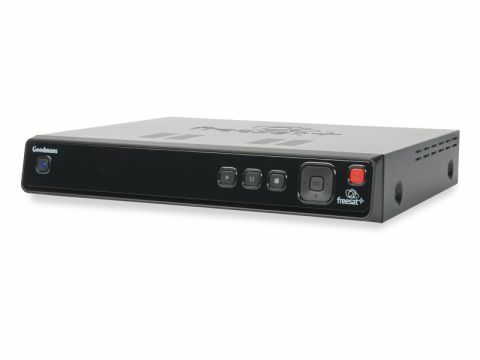 AV connectors comprise HDMI, twin Scarts, S/PDIF and optical digital audio output and Ethernet is included for iPlayer (not available for Harvard receivers at the time of writing), together with RS232 and USB ports for updates. The remote too is pretty much identical as that found with the Grundig, save for the Goodmans branding. The PVR buttons are rather on the small side but key pads such as the instant record and programme guide buttons are usefully more prominent. The menus don't have the sharpness of Humax's Foxsat HD-R receiver but initial setup procedure is standard for Freesat, prompting you to enter your postcode so that you receive regional variations for ITV and BBC. You can manually scan for other channels but there's no DiSEqC switching or motorisation. Frequency, polarity, symbol rate, format and modulation can also be entered and results added to a section in the main channel list. No EPG is provided for these or even now-and-next data in the information banner. Freesat has tight technical standards for its EPG and they're adhered to here. Again, it's not the sharpest looking but you can view guides for channels sorted by genre or according to favourites (just one list can be created). A programme information grid shows information for eight channels at a time in two-hourly chunks that can be skipped in 24-hour periods. You can also schedule reminders and set recordings. Up to two channels can be recorded at once, or you can view one while recording another. The receiver has a pause buffer for rewinding and fast-forwarding on the fly which can be extended from the standard 60 minutes with the option to commit cached material as a permanent recording to the hard disc. Recordings are stored in the library that has a thumbnail viewer and can be fast-forwarded and rewound at 64x normal speed slowed down to ½, ¼ or 1/8 with a progress bar to aid navigation. Standard-definition broadcasts can be upscaled via HDMI to 720p or 1080i and the receiver does a good job on the whole. SD pictures from reasonably good-quality broadcasts are sharp-looking when viewed using the HDMI connection, although they are predictably softer via Scart (but not unreasonably so). Provided that your TV's speakers are up to scratch, audio sounds bold enough via Scart and when hooking up the digital connectors to our hi-fi.